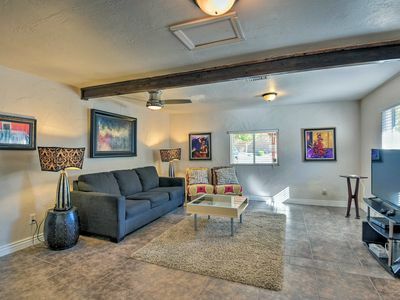 Contemporary Apt-8 Miles from Old Town Scottsdale! 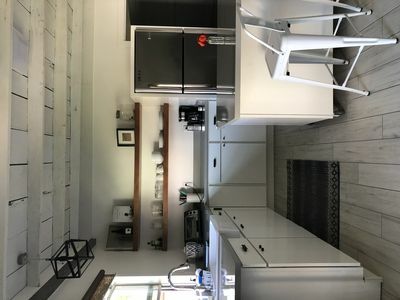 Book a trip to this newly remodeled vacation rental apartment near downtown Phoenix, the Phoenix Mountains Preserve and downtown Scottsdale! 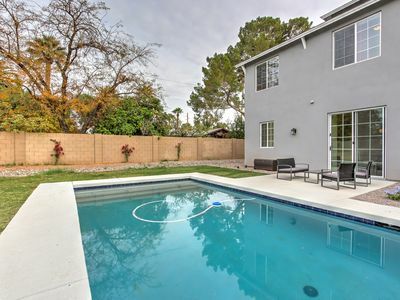 In addition to the home's top-notch location, this spacious home for 6 features 2 bedrooms, 1 bathroom, and a private backyard and patio! You'll also access to a gas grill and communal outdoor area during your stay. 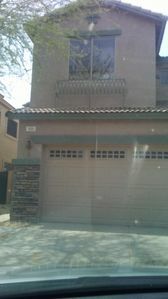 This beautiful apartment, complete with a private backyard, will be your private sanctuary in the heart of Phoenix. 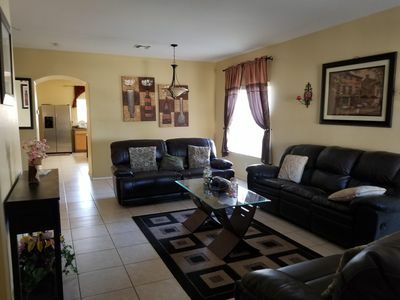 After a day spent watching Spring Training, retreat into the living room and unwind on the plush couch. As you watch your prime time favorites on the flat-screen cable TV, you'll be cooled down by the room's ceiling fan. 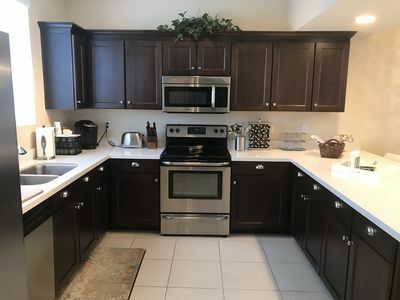 The fully equipped kitchen offers stainless steel appliances and expansive countertops, making it easy to 'wow' your friends with your culinary skills. 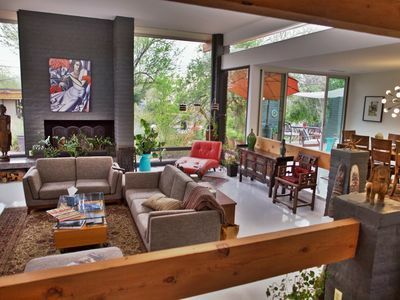 Once you've taken your final bites at the dining table for 4, pour yourself a glass of wine and head onto the covered patio. While the little ones play in the lush lawn, you'll be able to unwind at the table for 2 and enjoy the mild Arizona evenings. 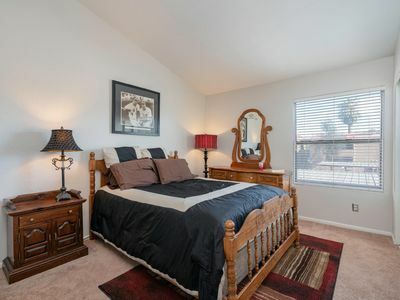 When it's time to call it a day, retreat into one of the 2 bedrooms and melt into the queen bed. 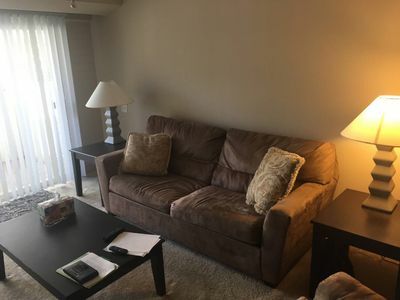 Two additional guests will find comfortable sleeping accommodations on the living room's queen sleeper sofa. Be sure to take advantage of the convenient community amenities during your stay. 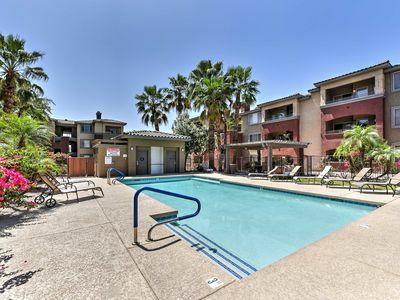 You'll have access to laundry machines, a shared gas grill, and an additional patio area just steps from the apartment. 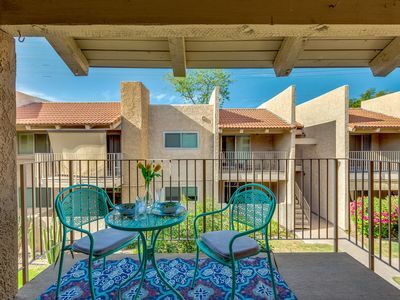 Located in Central Phoenix, this apartment sits in a quiet residential area just minutes from the Arizona Biltmore Resort. 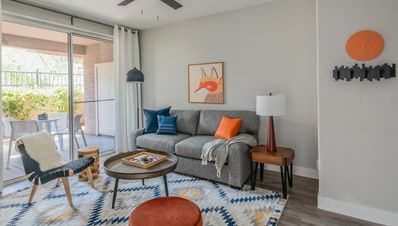 If city excitement is what you seek, spend some time in Downtown Phoenix or Old Town Scottsdale, both minutes from the property. These bustling areas offer delicious dining, top-notch shopping, and top-notch nightlife. 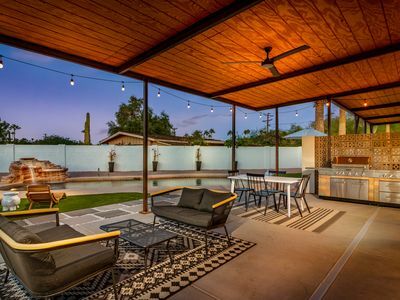 Just a short drive from the apartment in the heart of Scottsdale, you'll be able to watch several Major League Baseball teams prepare for the upcoming season. 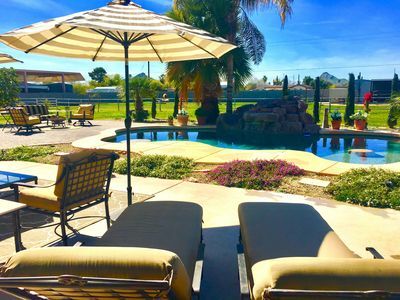 The Arizona Diamondbacks, the San Francisco Giants, Colorado Rockies, Brewers, and more call the Phoenix area their home for Spring Training. For even more outdoor fun, head 20 miles down the road to TPC Scottsdale, a world-renowned golf course. In addition to being the home of the Waste Management Open, TPC Scottsdale offers playable terrain for golfers of all levels. Lace up your hiking boots and explore the beautiful desert scenery that surrounds you. Located 5 miles away, the Phoenix Mountains Preserve is brimming with well-maintained hiking trails like Camelback Mountain Echo Canyon. 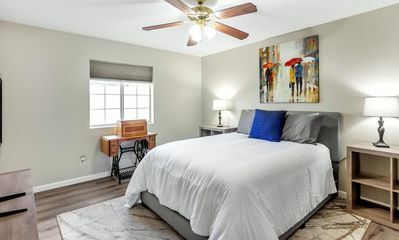 - Amenities include a fully equipped kitchen, flat-screen cable TV, covered patio, private yard, free WiFi, stainless steel appliances, a shared gas grill and laundry machines, covered parking for 1 vehicle, and more! 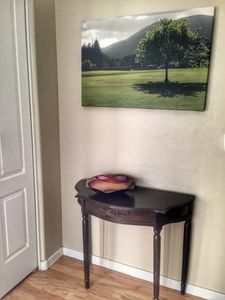 Phoenix Condo w/Balcony, Pool & Putting Green! 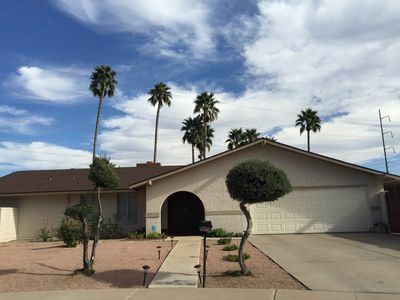 Beautiful Historic Mid-Century Home with Camelback Views!! Perfect Place for a Getaway!! 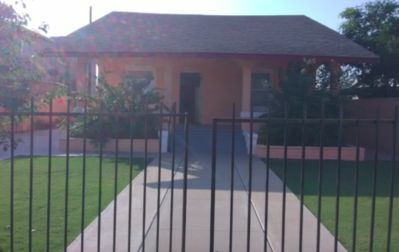 This Mountain View Gated home is rented to NON-Smokers only and this restriction applies to all guests. 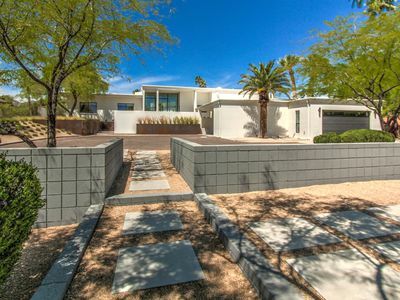 Entertainers Dream Home. Brand New Remodeled Instant Book Now!!! 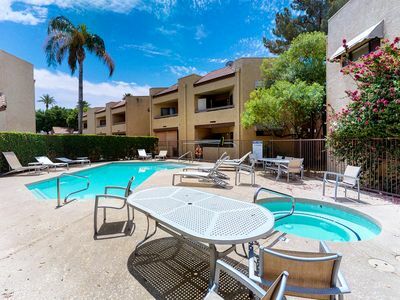 Large 2 Bedroom Courtyard View Steps from Scottsdale, Literally! Location Terrific!